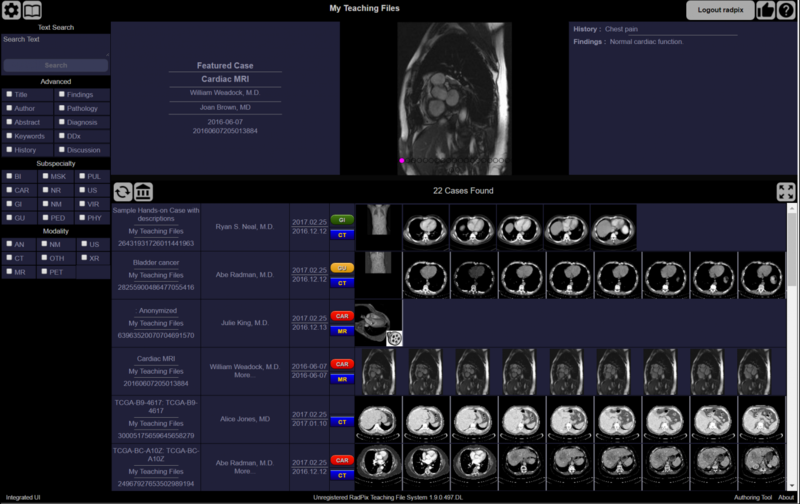 RadPix is a radiological teaching file system which can be integrated into a PACS environment. It allows users to send selected images directly from the PACS to a stand-alone teaching file server. Complete radiological teaching files can be created by adding text, annotations and images. Annotations are added using built-in drawing software, designed for radiologists. Images can be exported as JPGs, PowerPoint files, Image Stacks in PowerPoint files and videos. Publication quality TIFF images with annotations are easily created and downloaded. Users can scroll through stacks of images, change window and level settings, and toggle annotations on and off the images. RadPix is software to simplify radiological education. Getting images from a PACS doesn’t need to be a chore! How about this. While reading a case, select images then send them directly to your personal or institutional teaching file. You can then add text and annotations to the images to create a teaching file. You can also just download the images in a PowerPoint file, including in a special RadPix image stack. All images on 1 slide, with the ability to scroll through them, just like on a PACS! Need some annotated images for a publication? Easy. Export images as TIFF files with annotations.